To resolve this I tried changing SYS user password so many times, recreated password file and copied that to standby, but nothing worked out. Note: changing those parameter values need a restart of database. So, when ever you face similar issue of invalid username/password during standby creation, check the above parameters and change the values (if needed) and try. Today i got a bug in one of my oracle 10g(10.2.0.3) standby database. Cause: it is due to bug 6035495. Permanent Fix : Apply 10.2.0.4 patch to both primary and standby databases. For more information refer to metalink document 6035495.8. P.S: The above error may also occur when an incomplete recovery was performed on the primary database. It synchronizes the cpu performance with the database performance (This feature is usually not included in all the patch set. configuration information on a monthly basis. – a TRIGGER using %type variable of the other TABLE and DBLINK. · The performance of some queries which involve large sorts can be CPU intensive due to the memory allocation pattern used by the sort. Note: We will be modifying both the primary and standby parameter files to handle being in either the primary or the standby mode for quick switchovers. Shut down the primary database and copy or FTP its datafiles, redo log files, and the just-created standby parameter file and standby control file, to the standby site. Copy the standby control file on the standby site to the other file names listed in the control_files init.ora parameter. If your primary is using an spfile, set the primary database parameters in the spfile as listed earlier. End all activities on the primary and standby database. Change tnsnames.ora entry on all servers to swap the connect strings (myserver_prod and myserver_prod2). End all activities on the standby database. May need to resolve redo log gaps (not shown here). Change tnsnames.ora entry on all servers to point the primary connect string to the standby database. New standby needs to be created. Old primary is no longer functional. this query then there is a gap in the sequence numbers of the logs that have been received. This gap must be resolved before logs can be applied. This query detects bad statuses. When a bad status is present this query will return a “1”. The ‘ARCH’ process should always be ‘CONNECTED’. The ‘MRP0’ process should always be waiting for a log or applying a log, and when this is not true it will report the error in the status. The ‘RFS’ process exists when the Primary is connected to the Standby and should always be ‘IDLE’ or ‘RECEIVING’. This query detects missing processes. If we do not have exactly 3 distinct processes then there is a problem, and this query will return a “1”. The most likely process to be missing is the ‘RFS’ which is the connection to the Primary database. You must resolve the problem preventing the Primary from connecting to the Standby before this process will start running again. Verify all STANDBY PROCESSES are running normally on the STANDBY database. PROTECTION_LEVEL: current protection mode setting. Data Guard maintains these standby databases as transitional consistent copies of the production database. These standby databases can be located at remote disaster recovery sites thousands of miles away from the production data center, or they may be located in the same city, same campus, or even in the same building. If the production database becomes unavailable because of a planned or an unplanned outage, Data Guard can switch any standby database to the production role, thus minimizing the downtime associated with the outage, and preventing any data loss. Available as a feature of the Enterprise Edition of the Oracle Database, Data Guard can be used in combination with other Oracle High Availability (HA) solutions such as Real Application Clusters (RAC), Oracle Flashback and Oracle Recovery Manager (RMAN), to provide a very high level of data protection and data availability that is unprecedented in the industry. The following diagram presents a hi-level overview of Oracle Data Guard. A Data Guard configuration consists of one production (or primary) database and up to nine standby databases. The databases in a Data Guard configuration are connected by Oracle Net and may be dispersed geographically. There are no restrictions on where the databases are located, provided that they can communicate with each other. However, for disaster recovery, it is recommended that the standby databases are hosted at sites that are geographically separated from the primary site. A standby database is initially created from a backup copy of the primary database. Once created, Data Guard automatically maintains the standby database as a transactional consistent copy of the primary database by transmitting primary database redo data to the standby system and then applying the redo logs to the standby database. Data Guard provides two methods to apply this redo data to the standby database and keep it transactional consistent with the primary, and these methods correspond to the two types of standby databases supported by Data Guard. 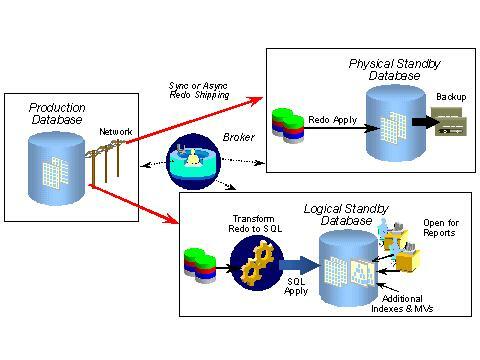 A physical standby database provides a physically identical copy of the primary database, with on-disk database structures that are identical to the primary database on a block-for-block basis. The database schemas, including indexes are the same. The Redo Apply technology applies redoes data on the physical standby database using standard Oracle media recovery techniques. A logical standby database contains the same logical information as the production database, although the physical organization and structure of the data can be different. The SQL apply technology keeps the logical standby database synchronized with the primary database by transforming the data in the redo logs received from the primary database into SQL statements and then executing the SQL statements on the standby database. This makes it possible for the logical standby database to be accessed for queries and reporting purposes at the same time the SQL is being applied to it. Thus, a logical standby database can be used concurrently for data protection and reporting. Using Data Guard, the role of a database can be switched from a primary role to a standby role and vice versa, ensuring no data loss in the process, and minimizing downtime. There are two kinds of role transitions – a switchover and a failover. A switchover is a role reversal between the primary database and one of its standby databases. This is typically done for planned maintenance of the primary system. During a switchover, the primary database transitions to a standby role and the standby database transitions to the primary role. The transition occurs without having to re-create either database. A failover is an irreversible transition of a standby database to the primary role. This is only done in the event of a catastrophic failure of the primary database, which is assumed to be lost and to be used again in the Data Guard configuration, it must be re-instantiated as a standby from the new primary. Maximum Protection— This mode offers the highest level of data protection. Data is synchronously transmitted to the standby database from the primary database and transactions are not committed on the primary database unless the redo data is available on at least one standby database configured in this mode. If the last standby database configured in this mode becomes unavailable, processing stops on the primary database. This mode ensures no-data-loss. Maximum Availability— This mode is similar to the maximum protection mode, including zero data loss. However, if a standby database becomes unavailable (for example, because of network connectivity problems), processing continues on the primary database. When the fault is corrected, the standby database is automatically resynchronized with the primary database. Maximum Performance— This mode offers slightly less data protection on the primary database, but higher performance than maximum availability mode. In this mode, as the primary database processes transactions, redo data is asynchronously shipped to the standby database. The commit operation of the primary database does not wait for the standby database to acknowledge receipt of redo data before completing write operations on the primary database. If any standby destination becomes unavailable, processing continues on the primary database and there is little effect on primary database performance. The Oracle Data Guard Broker is a distributed management framework that automates and centralizes the creation, maintenance, and monitoring of Data Guard configurations. All management operations can be performed either through Oracle Enterprise Manager, which uses the Broker, or through the Broker’s specialized command-line interface (DGMGRL). The following diagram shows an overview of the Oracle Data Guard architecture. What’s New in Oracle Data Guard 10g Release 2? This capability allows Data Guard to automatically, and quickly fail over to a previously chosen, synchronized standby database in the event of loss of the primary database, without requiring any manual steps to invoke the failover, and without incurring any data loss. Following a fast-start failover, once the old primary database is repaired, Data Guard automatically reinstates it to be a standby database. This act restores high availability to the Data Guard configuration. Several enhancements have been made in the redo transmission architecture to make sure redo data generated on the primary database can be transmitted as quickly and efficiently as possible to the standby database(s). A physical standby database can be activated as a primary database, opened read/write for reporting purposes, and then flashed back to a point in the past to be easily converted back to a physical standby database. At this point, Data Guard automatically synchronizes the standby database with the primary database. This allows the physical standby database to be utilized for read/write reporting and cloning activities. Archived logs, once they are applied on the logical standby database, are automatically deleted, reducing storage consumption on the logical standby and improving Data Guard manageability. Physical standby databases have already had this functionality since Oracle Database 10g Release 1, with Flash Recovery Area. Oracle Enterprise Manager has been enhanced to provide granular, up-to-date monitoring of Data Guard configurations, so that administrators may make an informed and expedient decision regarding managing this configuration. What’s New in Oracle Data Guard 10g Release 1? With this feature, redo data can be applied on the standby database (whether Redo Apply or SQL Apply) as soon as they have written to a Standby Redo Log (SRL). Prior releases of Data Guard require this redo data to be archived at the standby database in the form of archivelogs before they can be applied. The Real Time Apply feature allows standby databases to be closely synchronized with the primary database, enabling up-to-date and real-time reporting (especially for Data Guard SQL Apply). This also enables faster switchover and failover times, which in turn reduces planned and unplanned downtime for the business. The impact of a disaster is often measured in terms of Recovery Point Objective (RPO – i.e. how much data can a business afford to lose in the event of a disaster) and Recovery Time Objective (RTO – i.e. how much time a business can afford to be down in the event of a disaster). With Oracle Data Guard, when Maximum Protection is used in combination with Real Time Apply, businesses get the benefits of both zero data loss as well as minimal downtime in the event of a disaster and this makes Oracle Data Guard the only solution available today with the best RPO and RTO benefits for a business. Data Guard in 10g has been integrated with the Flashback family of features to bring the Flashback feature benefits to a Data Guard configuration. One such benefit is human error protection. In Oracle9i, administrators may configure Data Guard with an apply delay to protect standby databases from possible logical data corruptions that occurred on the primary database. The side-effects of such delays are that any reporting that gets done on the standby database is done on old data, and switchover/failover gets delayed because the accumulated logs have to be applied first. In Data Guard 10g, with the Real Time Apply feature, such delayed-reporting or delayed-switchover/failover issues do not exist, and – if logical corruptions do land up affecting both the primary and standby database, the administrator may decide to use Flashback Database on both the primary and standby databases to quickly revert the databases to an earlier point-in-time to back out such user errors. Another benefit that such integration provides is during failovers. In releases prior to 10g, following any failover operation, the old primary database must be recreated (as a new standby database) from a backup of the new primary database, if the administrator intends to bring it back in the Data Guard configuration. This may be an issue when the database sizes are fairly large, and the primary/standby databases are hundreds/thousands of miles away. However, in Data Guard 10g, after the primary server fault is repaired, the primary database may simply be brought up in mounted mode, “flashed back” (using flashback database) to the SCN at which the failover occurred, and then brought back as a standby database in the Data Guard configuration. No re-instantiation is required. Logical standby database can now be created from an online backup of the primary database, without shutting down or quiescing the primary database, as was the case in prior releases. No shutdown of the primary system implies production downtime is eliminated, and no quiesce implies no waiting for quiescing to take effect and no dependence on Resource Manager. Oracle Database 10g supports database software upgrades (from Oracle Database 10g Patchset 1 onwards) in a rolling fashion, with near zero database downtime, by using Data Guard SQL Apply. The steps involve upgrading the logical standby database to the next release, running in a mixed mode to test and validate the upgrade, doing a role reversal by switching over to the upgraded database, and then finally upgrading the old primary database. While running in a mixed mode for testing purpose, the upgrade can be aborted and the software downgraded, without data loss. For additional data protection during these steps, a second standby database may be used. By supporting rolling upgrades with minimal downtimes, Data Guard reduces the large maintenance windows typical of many administrative tasks, and enables the 24×7 operation of the business. SQL Apply now supports the following additional data types. This support for additional datatypes allows logical standby databases to recover and protect a wider variety of data, thus increasing the overall database protection and recovery options for Data Guard. It is now possible to use the Data Guard Broker, and the Broker’s Command Line Interface (DGMGRL), as well as Enterprise Manager, to create and manage Data Guard configurations that contain RAC primary and RAC standby databases. In Oracle9i, such administration is possible only through SQL*Plus. In Data Guard 10g, Data Guard Broker interfaces with Oracle Clusterware such that it has control over critical operations during specific Data Guard state transitions, such as switchovers, failovers, protection mode changes and state changes. Management based on best practices. Pre-built integration with other HA features. Data Guard provides an efficient and comprehensive disaster recovery and high availability solution. Automatic failover and easy-to-manage switchover capabilities allow quick role reversals between primary and standby databases, minimizing the downtime of the primary database for planned and unplanned outages. A standby database also provides an effective safeguard against data corruptions and user errors. Storage level physical corruptions on the primary database do not propagate to the standby database. Similarly, logical corruptions or user errors that cause the primary database to be permanently damaged can be resolved. Finally, the redo data is validated at the time it is received at the standby database and further when applied to the standby database. A physical standby database can be used for backups and read-only reporting, thereby reducing the primary database workload and saving valuable CPU and I/O cycles. In Oracle Database 10g Release 2, a physical standby database can also be easily converted back and forth between being a physical standby database and an open read/write database. A logical standby database allows its tables to be simultaneously available for read-only access while they are updated from the primary database. A logical standby database also allows users to perform data manipulation operations on tables that are not updated from the primary database. Finally, additional indexes and materialized views can be created in the logical standby database for better reporting performance. Oracle Data Guard offers the maximum protection, maximum availability, and maximum performance modes to help enterprises balance data availability against system performance requirements. If network connectivity is lost between the primary and one or more standby databases, redo data cannot be sent from the primary to those standby databases. Once connectivity is re-established, the missing redo data is automatically detected by Data Guard and the necessary archive logs are automatically transmitted to the standby databases. The standby databases are resynchronized with the primary database, with no manual intervention by the administrator. 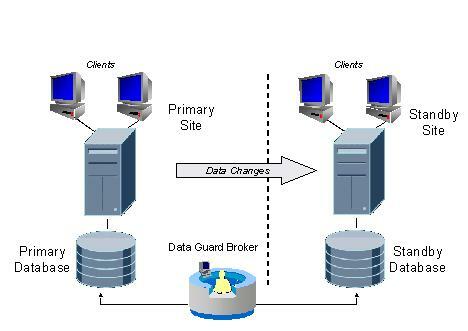 Data Guard Broker automates the management and monitoring tasks across the multiple databases in a Data Guard configuration. Administrators may use either Oracle Enterprise Manager or the Broker’s own specialized command-line interface (DGMGRL) to take advantage of this integrated management framework. Integrated with Oracle databaseData Guard is available as an integrated feature of the Oracle Database (Enterprise Edition) at no extra cost.